Not to toot my own horn or to sound weird but I always seem to get comments about how great my legs look. The first time I ever heard it, I was completely baffled because even though I love working out, I definitely neglect my legs. In fact, the only thing I loathe more than squats and lunges is cardio. That is until I discovered spinning. My addiction to spinning started about 5 years ago and I'm not even kidding when I say that after my first class I never wanted to go back again. My entire body was so incredibly sore, I could barely walk the next day and my instructor had a body I would kill for, which at the time didn't help my motivation. But for some reason, which I can't seem to recall now, I went back again and again and again and here we are, 5 years later and I'm still going. And when people ask me what I do to get my legs to look "like that" my only answer is cycle! So when Kerri called me up and told me about this new cycle studio called CycleBar® opening up by her work I was intrigued but still not 100% sold. You see, my gym offers spinning classes and I've been taking the same spinning class with the same spinning instructor (hi Jessica!) for 5 years now so why ruin a good thing? Then CycleBar® offered a free preview to stop by and check the place out to me and some other blogger babes and I maybe I'd stop by but apparently the fitness gods really wanted me to give CycleBar® a chance because the day before the preview (when I was still on the fence) my instructor announced that she would be leaving the gym to go work at CycleBar® and that sealed it. The next day I headed straight over to CycleBar® after work for the free preview and I'm already checking out their schedule! 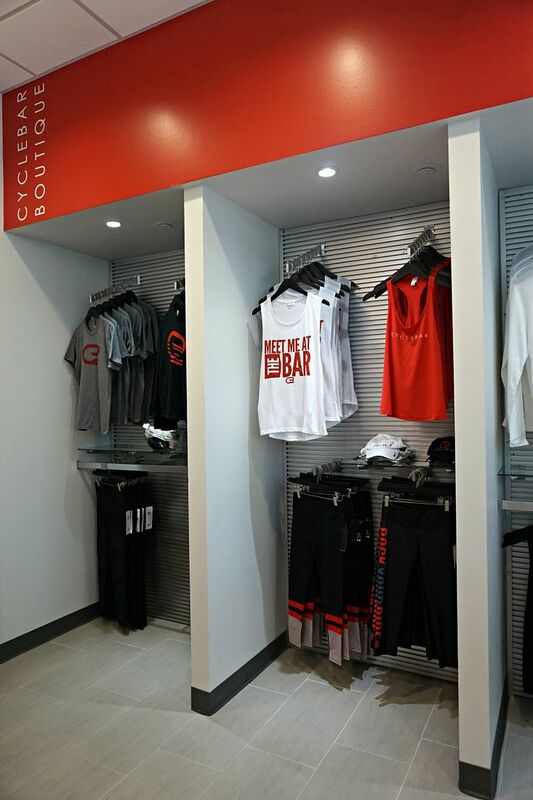 CycleBar is the only indoor cycling franchise in America and the first of its kind in Central Florida and the workout experience is unlike any other. This isn't your normal stuffy, boring room with bikes and someone barking "motivational" things at you while you peddle away. This is something you want to come back to. It's a high-energy, fun experience that has much more of a "club" vibe than a "gym" vibe. The first thing you notice when you walk through the doors is how chic the studio is. It's completely decked out in red, white and black and feels more like a place you'd want to hang out with your friends than a place you'd work out. One side has a little shop where you can check out their gear and grab your shoes for class and the other side has lockers, water and other necessities. 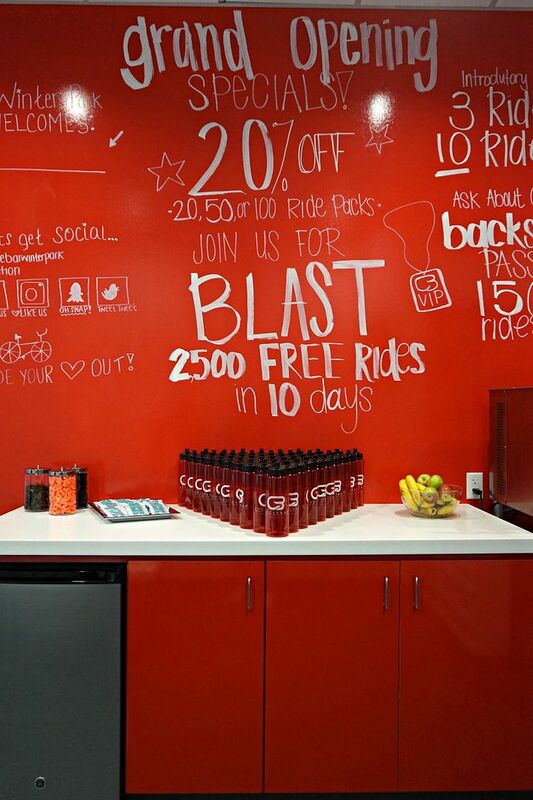 CycleBar® takes care of everything for you so all you have to do is show up and ride! They provide shoes, a water bottle, a towel. They even have hair ties for people like me that always manage to lose mine! Another thing I love about CycleBar® is there is no membership required and they track your stats for you so you can actually see your progress and feel good about your ride. If that didn't have you sold, CycleBar® is having their grand opening in Winter Park on September 29th and is offering 60 free classes for the public for the first 10 days they're open! Yup, that's right. Up to 2700 individual rides will be available! 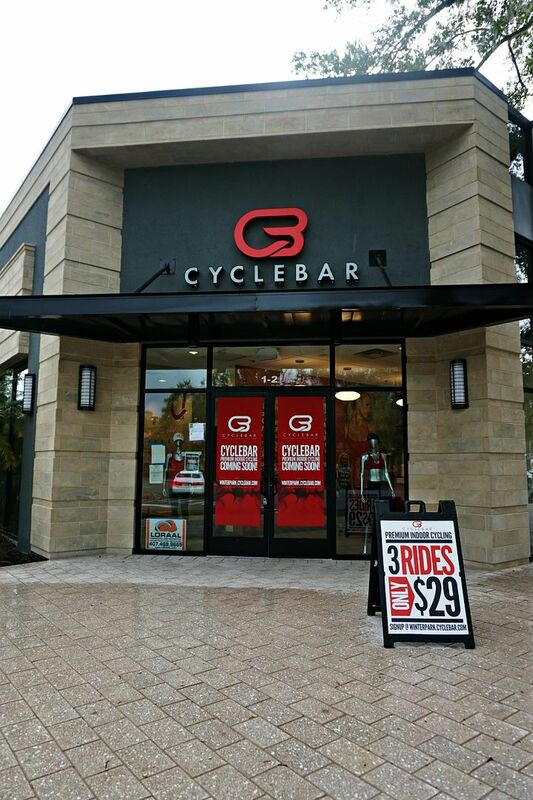 Advance registration is required at http://winterpark.cyclebar.com/. You can begin scheduling rides on September 22; free classes will be held from September 29 through October 9. Paid classes begin on October 10. So what are you waiting for – check it out! I would love to live next to one! I used to go to a spin class when I lived in California and miss it! I'm a big fan of spin too! This setup looks like the Flywheel that I go to and I love the stadium seating and super loud music. It's such an awesome workout! It seems like spinning is taking the world by storm! I hope we get one by us, I think it would be a great way to mix up my current workouts. The studio looks great! Looks like a great studio! I've never tried spinning but it sounds like a great workout! Spin is the only version of cardio that I'll do! I absolutely LOVE it! The Cyclebar looks super cool and modern! you know i'm going to be addicted to this one! it doesn't hurt that it's uber close and the studio is super cute (that matters of course haha) - looking forward to checking it out with you asap! Sounds fun - thanks for the feature! I would love to have one of these near where I live! I had a spinning addiction a few years ago... until they took spin classes away from the gym that I was a member of. I haven't been able to find one I love since then and I miss it so much. It's definitely one of the best workouts. They just opened up one of these in Charlotte and I went to one class. The facilities were awesome but my instructor was just okay... then again it was their very first day open. I truly believe it's all about the instructor and i'm obsessed with mine at Flywheel, but I may have to give this place another shot! I would kill to have a cycle studio near me! We have a million yoga/Barre studios, but no cycle places! Here is hoping that we get one soon because I am totally there! I've never done cycling! I absolutely love Pure Barre but still need to give cycling a try! I love spin! I wish there was one of these near me because they sound much more flexible than some other spin studios! I love all the special touches they have here! It's such a nicely set up studio too! I so wish we had one of these in St Pete! What an awesome workout enviroment!! I love spin but the classes at my gym don't cut it! Oh this sounds like such a fun place to workout! I wish I lived closer! I haven't got into spinning yet but I should definitely give it a try! i had no idea you were into spin! that is awesome. your legs ARE amazing so i need to do spin like right now lol. i used to do it a lot, but it's been at least 4 years since i went! crazy. oh no @ your instructor leaving - are you gonna leave your gym to follow her? a good instructor is key! when kerri posted about this i went and searched for one in the ville, and it's coming! i can't wait to try it. We just got a CycleBar in our city...and I wondered exactly what it was all about. I'm glad to have read this, Pam. It may be worth looking into, for sure. This sounds like so much! Love that its more of a club environment! Sounds like it would get you pumped! 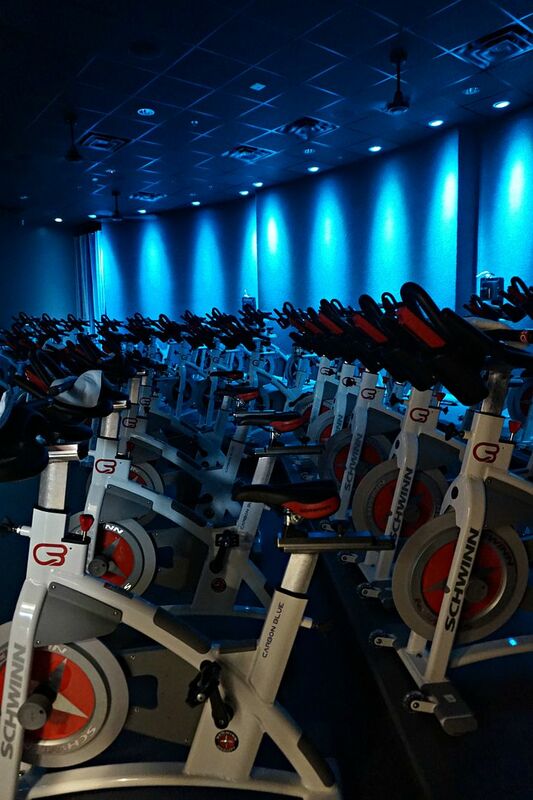 This looks like an amazing studio, I've never tried spinning yet but it sounds like a great workout! I (really) disliked spin the first time I tried it, but ohmylanta it's so pretty I think I would try again if the place looked like THAT! I did spinning right out of college and just loved it! Once I got over the soreness. :) Makes me want to check it out again! Such a fun concept! I have always been intimidated by cycling classes, but have wanted to try one out at the gym so I may have to just see what it's all about! Your legs are killer and I need to work on mine because god knows I'm not doing squats!